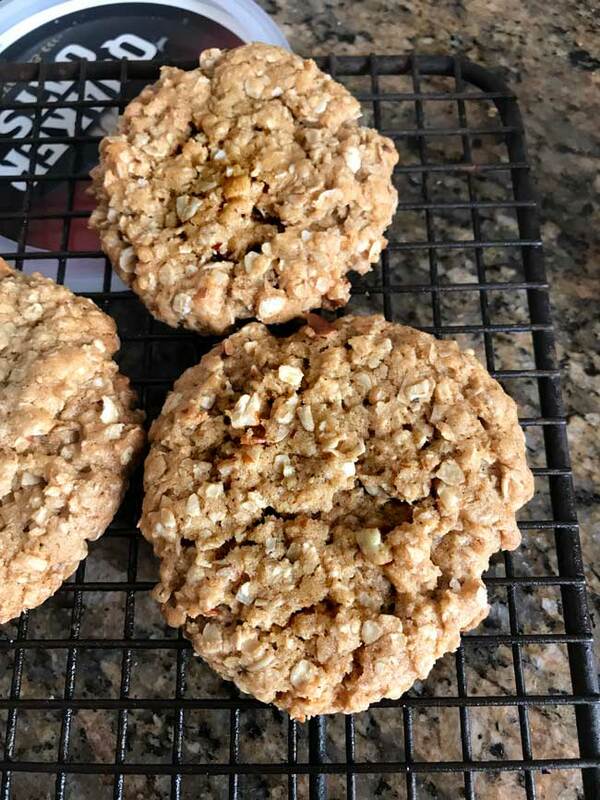 I came up with this recipe for crunchy oatmeal cookies while trying to create a cookie with the crunchiness of store bought but with the freshness of homemade. The shortening is key to the great texture, but you can substitute butter for a slightly less flaky, crispy, cookie. Also, I don’t use the word “hearty” in every day conversation, but it seems to describe these cookies hence the name. They are hearty oatmeal cookies! Here’s a more recent photo. A crunchy yet light cookie. Shortening is the key to the interesting texture. Stir together flour, baking soda, cinnamon and salt; Set aside. In a large mixing bowl, beat shortening, melted butter and both sugars until creamy (I used a wooden spoon). Stir in honey & syrup, egg and vanilla. Add flour mixture and stir until incorporated. Stir in oats, pecans and coconut. Using wet hands, form mixture into 3/4 to 1 inch balls and place about 2 inches apart on ungreased cookie sheets. Using palm of wet hand, press down slightly to about ½ inch. Bake at 350 degrees for 11-13 minutes or until edges are brown. Remove to a rack to cool. They will crisp and firm up quite a bit as they cool. Thank you so much for this recipe 🙂 I’ve been trying some oatmeal cookie recipes, but I haven’t got a really good one yet ;P so I think I’m gonna try this! It looks really good! Kelley, thanks for the recent review. I haven’t made these in a while but have been craving crunchy oatmeal cookies and probably should. Glad to hear using all butter works. Love the crunchy consistency of these cookies. I used whole wheat flour, and didn’t have any crisco, so just used butter, seemed to work ok. I tried choc chips in one batch, and raisins in another, and you know, they are perfect just as they are. The cinnamon and syrup adds enough sweetness, you don’t need extras. I will make these again! Try adding 1 or 2 cups of Rice Krispies with the oats, pecans, & coconut…mmmmm! Thanks for this — I’ve been looking everywhere for crunchy oatmeal cookies! hey tryed your recipe and absolutly LOVED them everyone wants them i cant get out of the kitchen ha ha but i did make a slight change i halved the flour and added an equal amount of flax instead it really worked out well and no one knows the difference! thanks for THE best oatmeal cookies! Oh, but I DO have something against chewy cookies. I believe that any word that has two hard “k” sounds should crunch. I rue the day that Chewy cookies became the rage. For I love me a good, hearty BITE. I have a great recipe from the great american cookie book for peanut butter chocolate chunkers that rocks my world if you want it. I have nothing against chewy cookies, but crunchy cookies — made properly and not just burnt to crunchiness, are extra satisfying. Debbi, so far everyone whose baked these cookies has had good results. I need to put a big star by this recipe or something. Excellent cookies. I made these with whole wheat flour which makes them even more hearty. There is JUST the right amount of molasses and coconut so both add to the flavor but neither dominates. This is now MY go-to oatmeal cookie recipe. Thanks! Thanks so much for stopping by my blog and especially, for trying the recipe. I really love these cookies too. What I like about them is that they are kind of “hearty”. They also (like ANZACs) have a pretty long shelf-life, especially if you use the vegan egg substitute. Lately, I’ve been adding mini chocolate chips as well. I made these on the weekend, and really love them. Mine came out of the oven a bit late, which has given them a caramelised taste and texture. 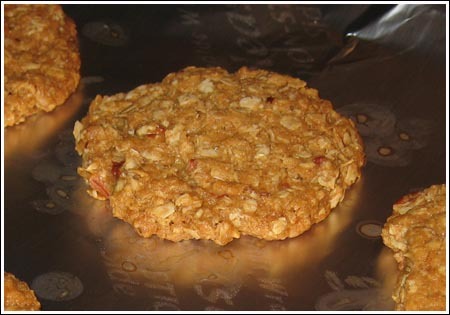 People who have tried them say they’re like Anzac biscuits – Australian biscuits with golden syrup, coconut and oats. But the cinnamon and honey give them an echo of baklava – so it’s like a bastardised Anzac recipe. I’m so glad Crisco has a TF-free version. Being Southern, I can’t help but use shortenin’! To be honest, there are a few recipes where I felt the trans fat free Crisco just didn’t perform as well as regular. I’d rather use it than the regular stuff, though. Frankly, if I could get my hands on good leaf lard, which is not hyrogenated and which I think you have to ask your butcher for, I’d try that. Then again, I wouldn’t want cookies to taste like pork. What to do, what to do? I’m all about moderation, but trans-fat scares the crap out of me. I do wonder why they are discontinuing it. Maybe next year they’ll say “Oops. We were wrong about tranfat and it’s really not so bad.” I’m waiting for that day, but not holding my breath at this point. I love the Trans-fat free crisco, but my Krogers just sold out on CLOSEOUT! Is that across the country or just here? I am down to my last 2.5 bars. RRRGGGG! Yum, glad to know the trans fat free Crisco is working out. I should check to see what’s in the pantry.